MEL MELTON, on what was intended to be a brief visit to Lafayette LA in the early ’70s turned out to be a life-changing experience. There he met, played with and forged lasting relationships with Sonny Landreth and Cheniers Clifton, Cleveland and CJ. After a long stint with Bayou Rhythm, Mel took time off from the music rat-race to concentrate on a chef career (another facet developed and sharpened from the early Lafayette days). 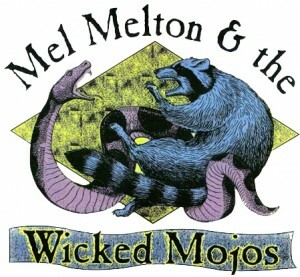 1990 found him back in NC and back at music, having formed the first edition of The Wicked Mojos.